Who is Johnny D. Boggs? We last wrote about Trade N Books way back in 2009 when it was at its old location. It’s still on Madison Avenue, just a few doors down. We went recently on a rainy day, and were pleased to note that while some things seem to have changed, others remain the same. In many ways, a town’s used bookstores provide a glimpse inside the people who live there. What you read says so many things about you – what holds your attention, what’s worth the investment of your time, as well as your hopes and dreams. 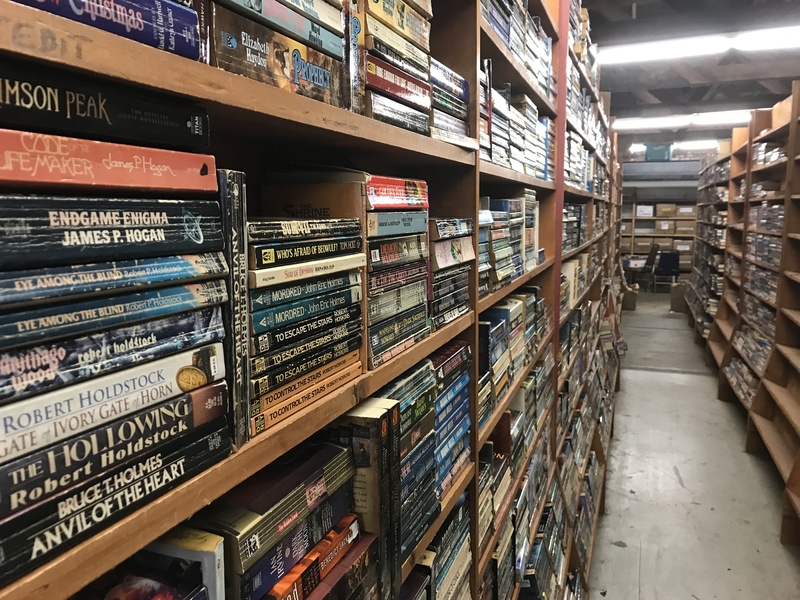 Sure, stores like these are full of the books we cast off – the prestige Time-Life sets, barely touched textbooks, Excel 1998 for Dummies, but most of the many thousands of pages here seem like they’ve been turned and even savored. The books you read are often different than the books you display in your house. Even if you’re not some deranged monster who buys books by the yard (or organizes a collection by color), many of us succumb to the lure of a coffee table book, prestige editions of the classics we’re forever meaning to read (and maybe want others to think we’ve read), a nicely bound Bible or even a dictionary. Time was that folks kept encyclopedia sets at home, sometimes paid for in installments with one book arriving at a time. My grandparents had one of these, with gold binding and imitation leather covers. In these, I learned for the first time about ancient Egypt, blue whales, the structure of our brains, the history of indigo dye, and other things that continue to fascinate me. These days, those sets are yard sale perennials. The Encyclopedia Britannica stopped printing editions in 2012. Now you can buy an old set on eBay for under a hundred dollars – though I’m not sure why anyone would want or use reference books from 1911. In any case, Trade N Books doesn’t stock many of these older things, or much non-fiction at all. The overwhelming (and really, it’s pretty overwhelming) majority of their titles are what’s often (and usually in a disparaging tone of voice) called genre fiction. 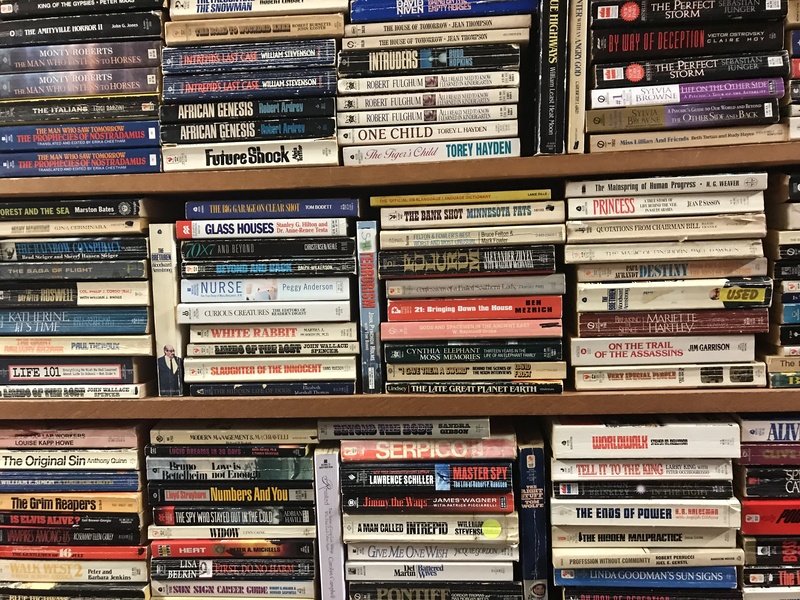 Hundreds of books in categories like science fiction, mystery, romance, and western are stacked horizontally in rows that maximize available space. We’re pretty sure they got new bookcases for the new space, or otherwise fixed up the old ones, because these are much cleaner and better lit than we remembered. Evidence of a recent population explosion? I come from a family of genre fiction lovers. My dad was a science fiction fan who read everything from terrible (ugh, so much Andre Norton) to breathtaking (the Foundation series holds up – I’ll argue about that all day). My mother, until the very day she died, devoured mysteries. She read some trash, sure (I can’t really stand The Cat Who books – don’t @ me), but I found some great authors through her recommendations: Jo Nesbo, Ian Rankin, Martin Cruz. We were library people. A military family doesn’t keep many books around. They make for exceptionally heavy moving boxes. But the library let you take out ten books at once, and we’d all pretty much make our limit every time. When we moved to the States after a long time living on bases abroad, my father got into trading books. The local shop was called Don’s Books. The owner was named Don, and so was my dad. Every couple of weeks my father would fill most of a paper bag with flimsy, fat paperbacks full of robots, spaceships, alien worlds and elaborately invented technologies. He’d go to Don’s and return with the paper bag, now with all-new books. It was kind of like the library, except you got credit and paid a little for each new book. Don’s is still there. He’s dead now, but his daughter runs the place. She carries a gun, drives an Avengers-themed dune buggy and maintains a warehouse of comics out back. Folks still come in with bags of books, and the store still writes everyone’s credit balance on their individually labeled paper. All of which is to say that although we don’t go to Trade N Books much, it is deeply familiar to me. 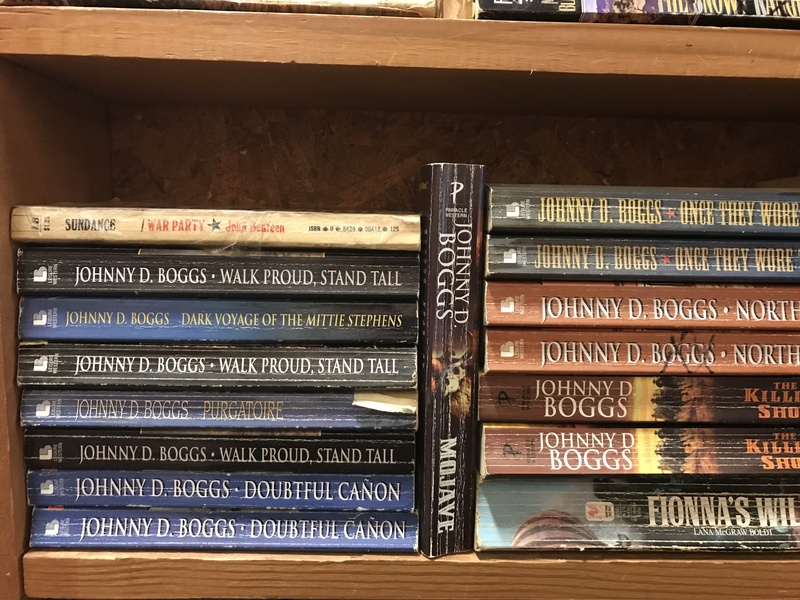 There are the piles of Westerns, in series with white or tan covers, numbered and recognizable by the font on the spines. Even a ton of old books by Louis L’Amour. My grandfather read these in afternoons spent on his aged leather recliner, all the time chewing tobacco that he spit into a disgusting styrofoam cup. There are an astonishing number of romance novels whose covers, in more “feminine” colors, seem like a vast assortment of Easter candy. They were subdivided into categories like “Love Inspired Romance,” “Regency Romance,” and “Paranormal Romance.” I haven’t read many books in any of these genres, but I remember being shocked that a high school friend who drove fast and wore a tough-looking leather jacket kept a box of Sweet Valley High books under her bed. Romance novels are not a niche product. Or, more to the point, they have a very large niche, comprising an astonishing one third of all books printed every year. Most of them seem to be for sale in Trade N Books. They aren’t for me. I prefer my romance to happen in real life, and frankly I was raised to think of these books as absolute trash. Though I wonder sometimes if I’m just being a snob about that. People who read these books are reading, at least – unlike the typical American, who reads just four books a year. 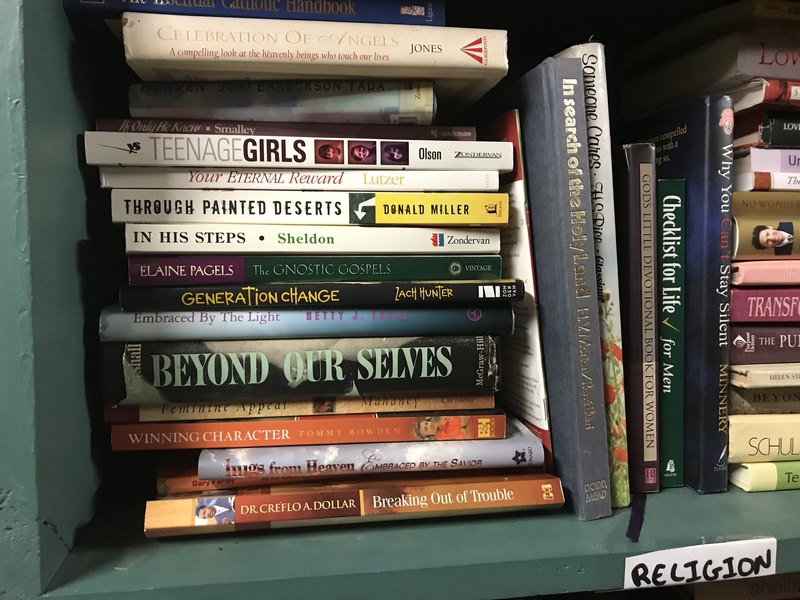 One side of the bookstore is devoted to the authors whose combination of popularity and prolific output merit a separate cardboard box with their name on it. Some were familiar: Stephen King, John Grisham, Nicholas Sparks (yuck), Andre Norton (twice in one post). Most we’d never heard of. Many seemed to be romance writers. In the very back of the store, behind a partial wall where there’s very little light, I found a surprisingly excellent selection of the kind of fiction I wanted to read. These didn’t have a genre sign. There were books by authors like Jonathan Safran Foer, Anne Patchett and Gillian Flynn (shouldn’t hers be in the mystery section?). I’ve sometimes heard them called “modern fiction,” which isn’t a good title because many of the genre books are also of recent vintage. I took a chance on two new-to-me authors. We went not really needing any more books. In fact, although we had a dozen or so in the trunk destined for Goodwill, we got a stack anyway. Turns out we just can’t resist a properly-priced interesting title or five. These included several wonderful, never-opened Time-Life books about paranormal phenomena, famous nutcase Hal Lindsey’s The Liberation of Planet Earth, and Weapons of Mass Destruction, which must be one of the last books in the old Opposing Viewpoints series. We tried to buy some more, including a Captain America collection, but here we ran into a little hitch. The owner, who presumably could have set a price on the spot, refused to sell it to us. She said that she first needed to enter it in her database. And judging from the massive piles of books behind and around her, this was not a rapid process. It was kind of surprising. We’ve been in a lot of used bookstores in our lives, and nobody has ever refused us a sale. 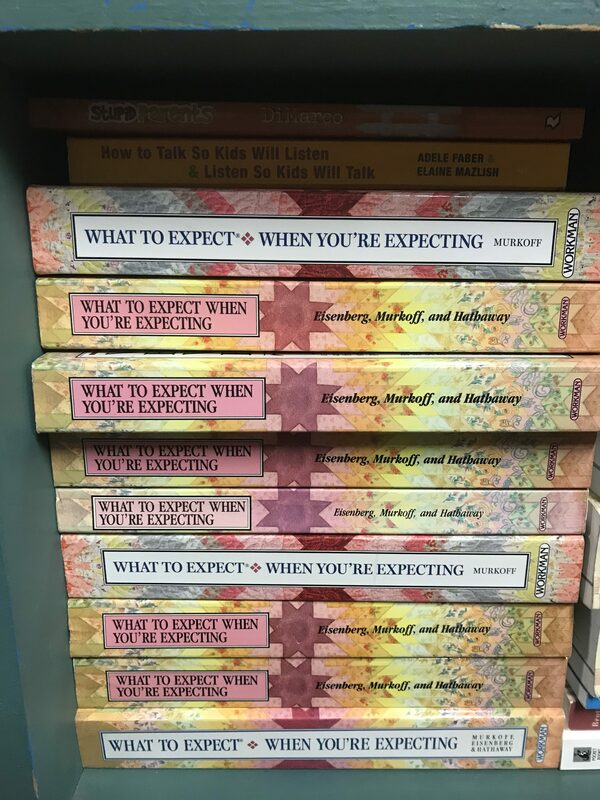 After she revealed that the other two floors of the building and a separate storage facility were also full of books that they never opened to the public, we understood more about the hoarding impulse at work here. The prices at Trade N Books aren’t too low to pass up, really. Most are half off the cover price, regardless of condition. But some have price tags. Most of these read “1.98.” The owner seemed genuinely confused when asked the significance of this number (as opposed to a more simple $2.00). But we left with some good deals. We’re not sure about the credit and exchange system, but it’s evidently good enough to keep them in business. So even though we last blogged about it back in 2009, Trade N Books soldiers on, and it’s still plenty weird. Plus, you don’t have to go out to Books-a-Million (which now seems to stock more novelty gift items than books). 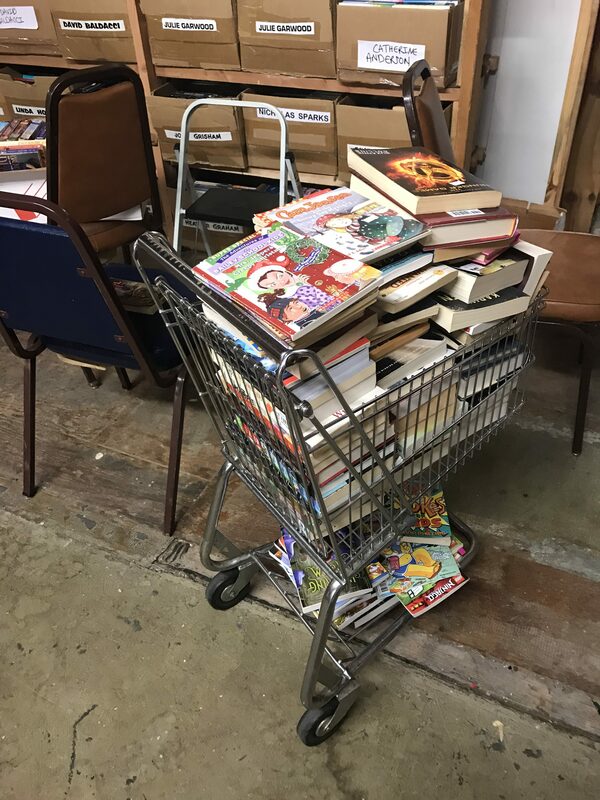 The new location for Trade N Books is neater and marginally more organized, though there are still piles and random boxes and even a stray overstuffed shopping cart. If a used bookstore tells you about a city, this one doesn’t show that we’ve got much of an experimental streak, or the castoff dregs of academia. Maybe Montgomery prefers predictable stories that transport us somewhere else for a time and finish neatly with no loose ends. Maybe, in the age of Amazon, used bookstores don’t tell us as much about the books we buy, just the books we jettison. Or these are just our temporary adoptions, the stories we shelter while they comfort us for a little while. They’re not so different, really, from palliative situation comedies or the relentless mitosis of shows where crimes get solved and doctors perform heroic deeds. And maybe they’re better. At least they encourage and activate the mind’s eye through the ancient magic of words. Reading isn’t dead yet, at least not for the people who lined up behind us clutching their own sacks of novels, each featuring a world ready to sink into on a lazy afternoon. Been a customer here since 2000. The only used, privately owned bookstore between here and Birmingham.